All the offices are 100% soundproof and come with built in use of the meeting rooms. Each office has been carefully designed with ready individual cassette air conditioners, all-in-one enterprise printers, Wi-Fi Internet and fixed line telephone connection. The venue also has a cafeteria to buy snacks with tea and coffee, and a full team of support staff like facility manager, receptionists, office boys and a dedicated network manager who will help your business flourish. The newly opened Furnished Interview Room Vashi has several options to offer like Meeting rooms, Conference spaces, Desk spaces, and team offices. Located in one of the most prominent corporate parks, it is very convenient from Vashi railway station. Vashi is known as the hottest city for many startups and organisations and new ventures. 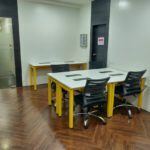 This Flexi at Vashi is ideal for start-up companies, freelancers, and entrepreneurs looking to interview candidates for building their teams. It is a versatile Interview Room and an ideal place for ad-hoc discussions, small team discussions, individual working etc. This Interview Room comes with very good Infrastructure with ergonomically designed chairs. This room has a very vibrant look and it will definitely boost your positive energy. High-speed Wi-Fi also allows you to take virtual interviews at this venue. It also has a good connectivity with public transport. You can reach this location easily. It is an ideal space for many startups and organizations. This space also has a managerial cabin. You can also get this space on weekend. This space is also available for 24 hours.